On Saturday 4 August, Lotto Soudal will be at the start of the 38th Clásica San Sebastián, a one-day WorldTour race in the Spanish Basque Country. Last year, the Polish rider Michal Kwiatkowski proved to be the fastest of a four-rider breakaway which included Tom Dumoulin, Tony Gallopin and Bauke Mollema. Michal Kwiatkowski wins the 2017 edition. The start will be given in Donostia, which is the Basque name for San Sebastián. After 228.7 tough kilometres, the riders will finish in that very same town. With eight official climbs including a double ascent of the Alto de Jaizkibel and the Alto de Arkale, the race in northern Spain will certainly be a hard one. The riders will cross the finish line for a first time at 17 kilometres from the end. During the local lap, the riders have to tackle the steep Murgil: 1.8 kilometres of climbing at an average above eleven percent. At the top of that climb, only seven kilometres remain till the finish. Last year, Lotto Soudal delivered a strong collective performance during the Clásica San Sebastián. 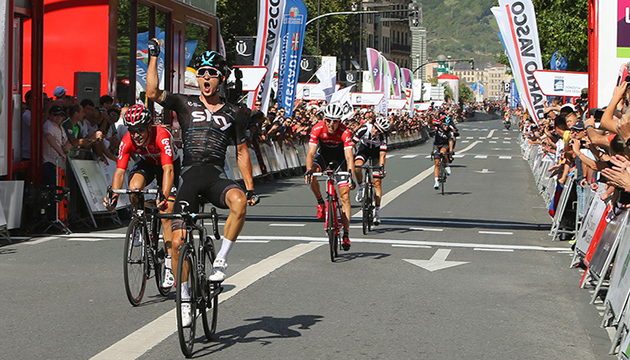 Then, the former Lotto Soudal rider Tony Gallopin came very close to the victory as he finished in second place. Tiesj Benoot and Jelle Vanendert both finished within the top fifteen. This year as well, the team has a strong line-up with Tim Wellens, Maxime Monfort and Jelle Vanendert. Frederik Willems, sports director at Lotto Soudal, previews the race in the Basque Country. Line-up Lotto Soudal: Frederik Frison, Tomasz Marczyński, Remy Mertz, Maxime Monfort, Tosh Van der Sande, Jelle Vanendert and Tim Wellens. The 75th Tour de Pologne will kick off on Saturday from Krakow, one of the country's oldest cities, which will play host to the first of the three consecutive flat stages, where the sprinters will fight not only for victory, but also for the honor of wearing the race's first yellow jersey. Katowice and Zabrze will then await the bunch on the next two days, giving the fast men the opportunity to seal the points standings before the event makes a U-turn and heads into the mountains. Tuesday will be the day that the landscape will change dramatically, when four climbs crammed into the second part of the 179km-long Szczryk stage will bring to the fore the general classification contenders and create the first gaps in the overall rankings. The fifth leg of the race could be one for the baroudeurs, before the showdown on the roads between Zakopane and Bukovina, a stage that is set to feature a string of short climbs culminating with a 10km-long ascent that will seriously test the peloton. The traditional Bukowina Tatrzanska stage is different than in the past years, but this doesn't mean it's going to be any easier, with several short hills sprinkled along the way giving attackers the chance to open some decisive gaps. Quick-Step Floors will look to enhance its already impressive 2018 palmares, and for that very reason will come to the start with a team that can be a protagonist regardless of the terrain. Alvaro Hodeg – who didn't waste any time this season in showing his potential in the sprints – will get the chance to go for other strong results, backed by a strong lead-out train that includes 2016 Tour de Pologne stage winner Davide Martinelli, Danish Champion Michael Mørkøv and Fabio Sabatini. Together with Eros Capecchi and Dries Devenyns, Tour of California top 10 overall Laurens De Plus will hope to be up there once the road will rise. 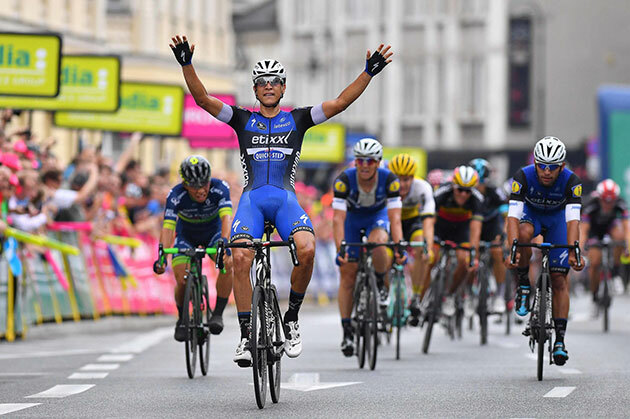 Davide Martinelli wins the first stage of the 2016 Tour of Poland. "Always a well-organised race, the Tour de Pologne is the first big and important appointment for many of the riders after the summer break, so motivation won't be a problem", said sports director Rik van Slycke. "The rolling parcours, with many steep climbs, is a selective one and the weather could also be a factor during the week, like it was the case on many of the previous editions, but we are prepared to play a role there, be it in sprints, breakaways or uphill finishes."